When I first met B. J. Seymour, I saw a petite, soft-spoken older woman. I was a young 20 something attending orientation at Randolph-Macon College and B.J. was to be my adviser. I had bad experiences in the past with advisers. So, I didn’t have very high hopes. In short, based on my first impressions of B. J. I passed a judgment about her. How could she possibly help me? What was I going to learn from her? But, I would soon be proven wrong. B. J.’s classes were some of my toughest classes at Randolph-Macon. She knew my ability and held me to it. She pushed just enough so that I would not only be challenged but so I would work harder. B.J. would become a trusted adviser guiding me through my academic career, providing opportunities for me to serve and grow, and all in a quiet, but a wise voice. Luke Skywalker does the same thing when he first meets Yoda, the Jedi Master. All Luke sees is a short, green goblin man. Luke doesn’t even think Yoda could be the Jedi Master. Luke, a lot like I did, failed to see past appearance. Perhaps Luke expected someone more like Obi-Wan. Someone, perhaps, more human. Someone who spoke louder and with great power and authority. 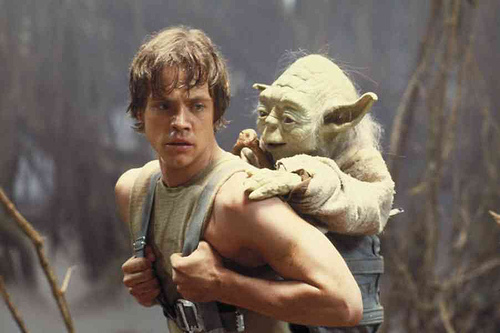 But the lesson Luke learns from Yoda (and I from Dr. Seymour) is that louder is not always better. The writer of Ecclesiastes tells a small parable in chapter 9 that draws the contrast between a loud, powerful king and a poor, wise man. No one remembered the words of the poor man, yet the words of the powerful king only brought war. Too often we listen to the loudest voices over the calmer, quieter voices. Instead of wisdom, we tend to only find war. Louder and stronger are not always better, the writer reflects. When have you passed by someone’s wisdom simply based on their appearance? What quiet and calm people do you have in your life? Pray: Gracious God, forgive us when we make judgments on others based on their appearance. May your Spirit teach us to seek wisdom from those calm and soft voices in our lives. Amen.